TUSCALOOSA, Ala. — It was media day for the College Football Playoff National Championship Game in Arizona and a radio show had asked University of Alabama defensive lineman Da’Shawn Hand if he would participate in a live interview. The players were all wearing their jerseys, but the person introducing him obviously never saw the name on his back. It led to an awkward moment when the first question was about the other guy who wore No. 9 for the Crimson Tide. Hand can joke about it now, but he still shakes his head at the memory. At least the radio personalities didn’t say he looks like a young Mike Tyson. “Awww, man. C’mon. Don’t do me like that,” Hand said about the slight resemblance. 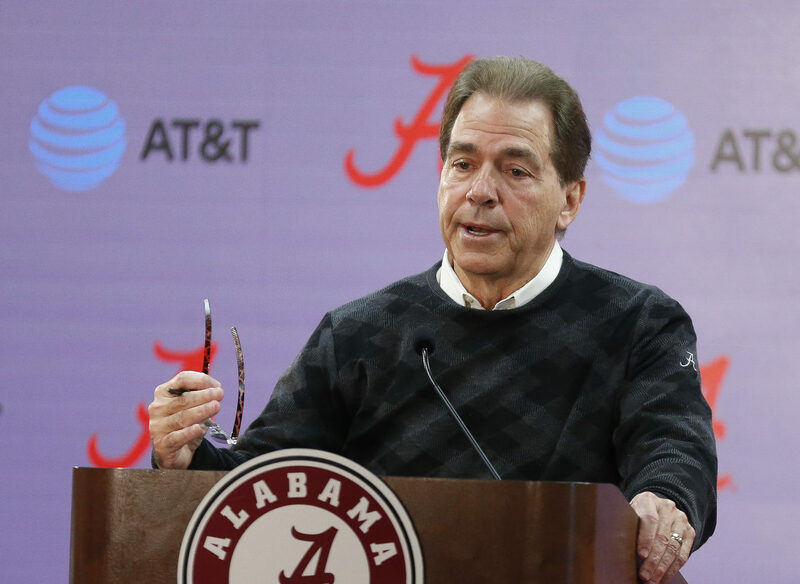 Players tying to make a name for themselves can be tough enough at Alabama, but some come in with an expectation level that borders on the ridiculous even though they can go unrecognized when walking down the street. Crimson Tide fans in particular are guilty of the over-optimism regarding big-time prospects, especially at high-profile positions. For example, this time a year ago every Alabama beat reporter was asked nearly non-stop about new quarterback Blake Barnett like he should have been starting already. This spring there have been comparable comments like, “Hey, I hear Jalen Hurts is pretty good,” but it hasn’t been as relentless. They always seem to ignore the fact that every quarterback Nick Saban has brought in has redshirted his first year to give him a chance to develop, get accustomed to the college game (and lifestyle) and learn the offense. AJ McCarron was nearly the exception to that when Greg McElroy suffered cracked ribs against Florida in the 2009 SEC championship game. Instead, he helped lead Alabama to back-to-back titles in 2011 and 2012, and with the extra year nearly pulled off the three-peat. For Hurts to play this season it would likely be because either 1) Alabama had numerous injuries at quarterback, 2) he beat out every else on the depth chart, and/or 3) the dual-threat player brings such a unique element to the offense that the coaches felt it’s worth giving up a year of eligibility to play him. But Scarbrough falls into a different category when it comes to fan buzz: big playmakers who they can’t get enough of. We’re talking about Julio Jones- and Henry-kind of hype. Even his own teammates have regularly drawn physical comparisons between Scarbrough and last year’s starting running back. During his testing at the NFL combine, Henry measured 6’3” and 247 pounds, and still ran the 40-yard dash in 4.54 seconds. Scarbrough is listed as being 6’2” and 240 pounds, although he came into the spring having lost 10 pounds because Alabama believes 230 to be his ideal playing weight. “We give everybody a muscle mass, body fat, hydration, functional movement test,” Saban explained. “We try to work hard with [team nutritionist Amy Bragg] to come up with what’s the most efficient, effective weight for a guy. We see how this guy’s moving, how he’s running relative to how he used to run. It also signaled one important thing everyone needs to remember: Scarborough isn’t Henry and it’s unfair to expect him to be. Maybe eventually he’ll post comparable or even better numbers, but for now here’s what Scarbrough’s done: Seven games, 18 attempts, 104 rushing yards (5.8 average per carry), and one touchdown. His longest carry was just 24 yards. He’s still learning the offense, the blocking schemes, his teammates, the opposition and so forth. It took Henry two years to put all together to the point he could make his Heisman Trophy run, but if Alabama had to open the 2016 season tomorrow, Damien Harris would probably start at running back. He was a consensus 5-star recruit as well in 2015, according to the 247Sports composite rankings, and has a little more experience at this level. “I certainly see a more confident and knowledgeable guy in Damien this spring so far," Saban said. Together the two could potentially form quite a combination this season, especially if Alabama’s offensive line takes a step forward as many believe could happen. But for now the key word is "potential" because no one knows things like how they’ll hold on to the ball on third-and-short and pick up blitzes until they do it. Consequently, take last Saturday’s scrimmage when Scarbrough had a 95-yard touchdown and was credited with 132 yards on nine carries, as verification that he’s fully arrived. Consider it an important first step in following his own path, albeit one of which few will want to get in the way. Quotes were obtained firsthand unless otherwise noted. Christopher Walsh is a lead SEC college football writer. Follow Christopher on Twitter @WritingWalsh.